Fabric is usually measured by the yard. This means that when you buy a yard of fabric you’re getting 1 yard x the width of the fabric (usually measured in inches). The most common widths of fabrics are 36″, 45″, 54″, 60″, 72″, and 118″. Be sure you know what the usuable widths are as some fabrics have borders. Usable widths are usually 1-2 inches less than the full width, though in some cases the entire width is usable. You can also estimate a yard of fabric by holding one end of the fabric to your chin while fully extending your other arm which should hold the other end of the fabric. 1.2 is strictly prohibited after the drink operation, driving is not allowed to smoke, diet and chat. Before work, check the battery storage capacity, as well as braking, direction, speakers, hydraulic systems and other devices are sensitive and reliable, with fault operation, power shortage should be added in time. 3.6 Observe the voltmeter voltage of the electric forklift, if it is lower than the limit voltage, the forklift should stop running immediately. After the end of the work to the electric forklift in time to charge, charging around the place to prohibit all sources of fire. Hangzhou Strength Machinery Co., Ltd. DESIGNER & MANUFACTURER ON TEXTILE MACHINES! Suntech is one of the leading designers & manufacturers on textile machines for weaving & finishing units, especially for Fabric Make-up Machines and Material Storage & Handling Equipments. Over 40 years experience, Suntech now has its brand office in Hong Kong and International sales office in Hangzhou (Hangzhou Strength Machinery Co., Ltd). In addition, its factory is located in Ningbo city, Zhejiang, mainland. All kinds of Warp Beams. What’s more, Suntech has the capability to design every unique machine to satisfy it’s customers’ special requirements. Suntech’s global vision and ambition has not limited its success and growth in the domestic market. With more than 2, 500 customers and 6, 000 installations around the wolrd, Suntech now has its agent network in Italy, Spain, Japan, Brazil, Argentina, Colombia, Peru, Guatemala, Indonesia, Thailand, Vietnam, India, Pakistan, Bangladesh, Sri Lanka, Mauritius, Iran, Egypt, South Africa, etc. above provides an easy control of fabric. Fabric Inspecting and Measuring machine is specially designed for inspecting and rolling up all kinds of knitted,printed,cotton,tricot and woven fabrics etc. 1.Special designed lopping inspecting board which is near to operator makes it easier to mend or label fabrics. 2.Fabric tension is adjustable via two inverters. 3.Eequipped with spiral spreading roller to eliminate curled edge and avoid shrink of fabric width.Expanding power 1/2HP. 4.Working speed is managed by inverters and easy to control by the buttom on control panel. 5.Digital counter could make accurate measurement of length in yard or meter which can be interchanged. 6.Winding roller and feeding roller are driven by gear motor. 7.Auto.edge-alignment system consists of edge sensor and hydraulic station made in Taiwan is adopted. 9.Inspecting board is made of milky color acrulic. We offer fabric inseption machines which are used as a testing machine to detect the defects in a fabric. These are equipped with drive operated AC motor thus ensuring saving of power. Machines are equipped with all necessary features like tensionless handling, accurate length measuring, appropriate illumination, Straight roll selvedge, variable roll hardness, auto cutting etc. * Efficient inspection of medium & heavy quality fabric. * Efficient inspection through top & bottom illumination. * Tensionless movement of fabric on inspection table. * Full forward & reverse run of fabric. * Speed variable from 0 – 60 mtrs/ min. * Compact & crease free rolling on winding tubes. * Max. Roll dia. Up to 1000 mm. * Machine with any input & output of Roll/ Pile/ Big Batch can be manufactured. * Length measurement by reputed counter meter. * Straight & uniform roll winding through efficient selvedge guider. * Operator friendly, improves productivity, reduces labour. It certainly doesn’t look as menacing as many of its larger forklift cousins. But your electric pallet jack has its own set of safety concerns. These trucks come in a number of varieties and those are broken out by the Industrial Truck Association this way: What are the safety concerns then? Could you name them all? Here is a Pallet Truck Safety List. Do not operate or work on this truck unless you are trained, qualified and authorized to do so. Operate this truck only from the operator’s position. Know the truck’s controls and what they do. Before working on this truck, always turn the key switch to OFF and disconnect the truck’s battery connector. Do not operate this truck if it needs repair or if it is in any way unsafe. Do not wear watches, rings, or jewelry when working on this truck. Obey the scheduled lubrication, maintenance, and inspection steps. Clean up any hydraulic fluid, oil, or grease that has leaked or spilled on the floor. Always park this truck indoors. Do not use an open flame near the truck. Do not park this truck in a cold storage area overnight. Do not use gasoline or other flammable liquids for cleaning parts. Do not wash this truck with a hose. 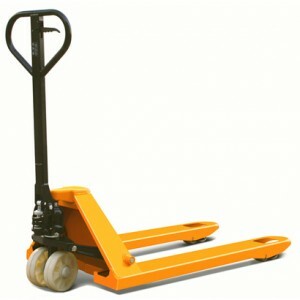 1.Hand Pallet Truck is small and light,can work in narrow lane and enter into elevator with full load. 2.Control part is installed at upper position of the handle, easy to be operated. Flexible control mechanism is reliable and safe. 3.Hand Pallet Truck provide with super-loaded automatic loading device and full-loaded device,so as to effective protect main parts such as vehicle frame and etc. 4.Adopting high strength polyurethane wheel with features such as stability flexibility, portability and on magnetic field and spark,etc. 5.The fork width and length can be selected so meet your any tray requirements. Life’s tough for pallet trucks. They must manoeuvre in tight spaces, withstand impacts, deliver power on demand and give operators controlled performance. There is a pallet truck to fit any need with capacities from 1.6 to 2.5 tons and advanced features such as electronic steering, programmable performance, shock reducing operator suspension system, braking and sealed high-frequency charger. 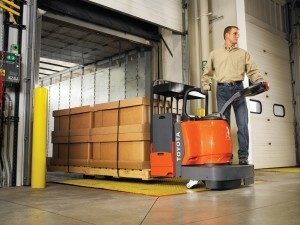 The Pallet Truck Series is truly the “workhorse of the warehouse”. This pallet truck has precise and efficient controls, a responsive AC drive motor and robust components to face a variety of challenges. 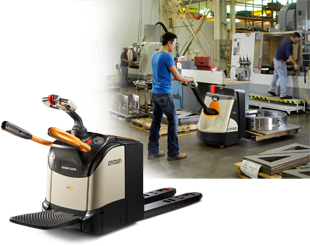 The high lift pallet truck model offers additional flexibility for special applications. For even bigger demands, the Pallet Truck Series has the strength, power and speed to handle heavier load weights and the most extreme environments. inspection with a totally detachable body. Convenient hand pendant for easy, immediate control to inch forward/backward. checking as well as a fabric holding tray. system. DC boards and electronics form an internal part of the system. The system consists of a state-of-the-art variable frequency drive inverter for precise speed control and proximity sensors to control the uniformity of edges. Reliable and accurate length measuring by an electronic wheel type encoder. Electronic recorder of defects, counters etc. Zero tension arrangement for delicate fabrics, using latest electronic sensors with dual inverter control system. Width of viewing glass is 72 inches, which allows for inspection of fabrics with greater width. Totally detachable light weight body, makes the installation and transportation of this machine easy. Fabric rolls smoothly through the roller systems,(with tension adjustments) onto a holding pipe. A meter counter is interspersed to count the number of meters of the fabric. A defect meter can be installed. Being smaller in sie this machine consumes less energy.